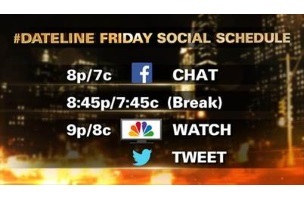 The season premiere of NBC newsmagazine Dateline Friday night will incorporate Facebook and Twitter. Anchor Lester Holt and the Dateline correspondents will answer questions on the show’s Facebook page at 8 p.m. ET. Holt and the correspondents will then live-tweet while the show airs at 9 p.m. The Dateline page was approaching 1.2 million likes at the time of this post. Readers: Will you interact on Facebook or Twitter prior to or during Friday night’s season premiere of Dateline?